Put your whole self into what you are doing, and your passion will shine through to others. You know others who just show up and that is it. 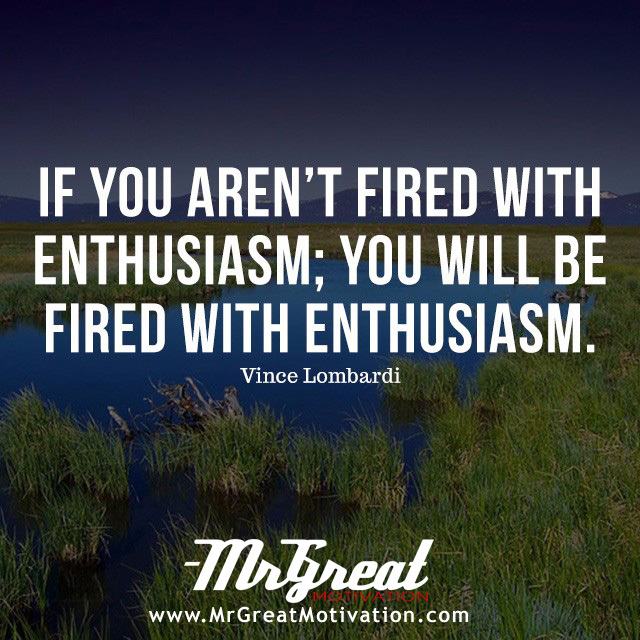 Get with the program or leave, and go somewhere where you can be enthusiastic and excited. Re-energize yourself, set new goals, be all that you can be. Time flies, it’s up to you to be the navigator and reach your goals. If you don’t have the enthusiasm for your work or your goals the organization will show enthusiasm in asking you to leave and your same condition with a goal. You may not accomplish your desires with lack of enthusiasm. Motivating others is the result of your enthusiasm. There will other fundamentals and tactics available that you might be using in the profession. But one of the keys is to success is to express our passion and excitement for what we represent and how it can help our prospects and also help individuals to meet the goal. By protecting your business or service with the enthusiasm, the perception and worth of your business or professional growth will skyrocket, and you will end up delivering more to those who matter most.